Some work remains on the TX info but, I have the block information working accurately as of 5 minutes ago. Please bear in mind, this is an x14 coin. Enhancements, such as this one, need much work and are not just a simple cut-and-paste-from-another-coin job. That AND all other x14 coins are made with Qt4. BERN is the only x14 coin made with Qt5, to my knowledge and much research. Much work is involved to build BERN on-top the latest foundations. There was a few bugs in the statistics previously. The net hashrate and the volume (money supply) were reporting inaccurately. Both of these issues have been fixed and I believe the statistics are ready. Any new updates on the wallet Steven? I know you have been working hard on it don't want you to think i'm pestering you, lol. I have been doing a lot of polishing. Ironing out the remaining wrinkles in the block explorer. 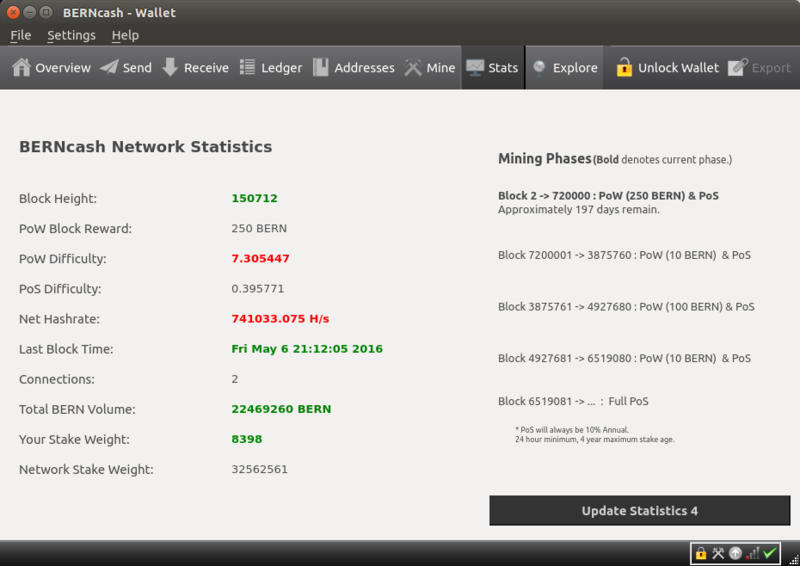 A lot of system admin work needs to be done for the "easy" mining I am implementing, few on the wallet side remain. Waiting on some new art work, most probably implementing that. Do up some checkpoints. Build in all the seed nodes and the source will be done, I will push it to github at that time. Get the seed nodes all on the latest greatest. Then build windows and mac. I know I said I was aiming for a week about a week ago. I knew I was making a soft projection, at that time not even certain what all I would be adding, and is why I said it was not firm. All-in-all it has been coming together nicely. I want to say only a few days remain but, given both the uncertainty of one enhancement specifically and demands from both my personal and professional life, that projection is not firm as well. Bearing a catastrophic event, we should all be on the new version (optionally) sometime this week. I will keep plugging away! BOO YAH! The in-wallet "easy mining" is done on the wallet side. This is not solo mining, it is pool mining and income will be a certainty. It can not be simpler unless I made the wallet mine with no intervention and behind the scenes. Which, that is technically PoS mining, and it already does. Oh yeah! Well done Steven. Can't wait to get it. Laptop should be here tomorrow eeeeek!!! !